Hull was awarded City of Culture status for 2017 in 2013, providing the city with not only an economic boost but an increased feeling of pride and confidence. According to a recent report from Hull University, over 1.4m visitors attended cultural events and activities during the first three months of 2017, heralding the success of Hull UK City of Culture 2017. As part of the celebrations and investment into Hull’s cultural scene, Hull City Council took the decision to refurbish the old Grade 11 listed Hull Theatre, believing it to be a huge compliment to the City of Culture programme that would revive the theatre culture, in addition to attracting tourists from around the world. The council secured £13m from central government coffers in March 2016 towards the festival which was outlined in the then Chancellor’s Budget speech. Part of the funding was earmarked for the theatre, with the investment seen by the council as an enhanced offering in its City of Culture status, and a way of ensuring that Hull can play a full part in the Northern Powerhouse. 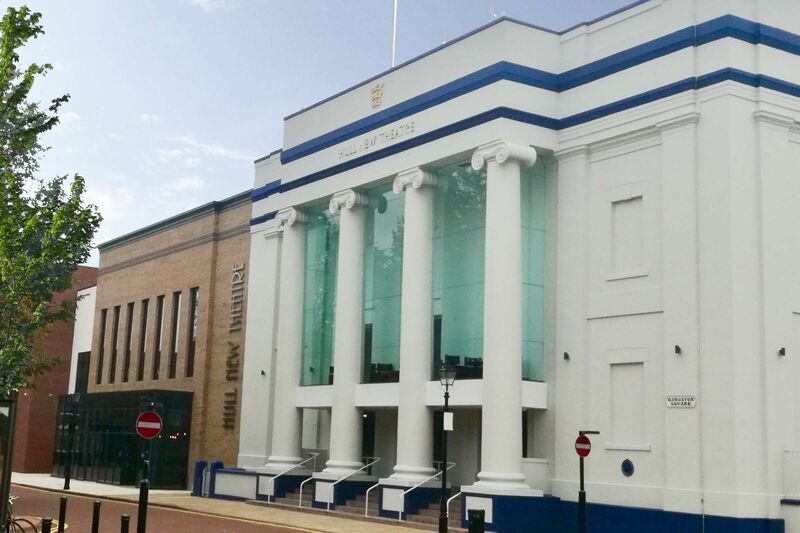 The Hull New Theatre is now complete and ready to be enjoyed by the theatre-going masses for musicals, opera, ballet, drama, children's shows and one-night performances, following its two-year £14 million intensive refurbishment programme. Space Architects were proud to be brought on board by the main contractor for the project, Sewell Group, to provide detailed design and construction for this impressive new building that would help cement Hull on the theatre map and help celebrate the rich culture of this historic city. The original theatre layout lacked the facilities needed to deliver the impressive and bigger shows envisaged by the council. They saw the refurbishment as an ideal opportunity to accommodate larger touring theatre companies that would bring in important revenue, and develop Hull’s cultural scene. The theatre needed a bigger stage, an increase from the 1100 seats to 1300, and a secure service yard. The council also wanted to incorporate a café bar which would provide an income stream during the day, and help to improve the overall visitor experience. Space Architects worked closely with all stakeholders including theatre management and technical staff to match the finished building with the original vision and completely redesigned the back of house facilities, which now boasts new dressing rooms, wardrobe and other facilities for the house performers. The larger stage and fly tower, new loading dock and stage dock facilities from the shared service yard are complete and ready for the first performances. There are more auditorium seats, a new accessible entrance and box office, a new ground floor Café bar and a new first floor Circle Bar with event space, in addition to new high standard washroom facilities. To ensure comfort and to deliver the most exciting shows, a new modern, efficient heating and ventilation system and an enhanced sound, light and audio visual system have also been fitted into the fabric of the building. The existing listed façade on Kingston Square required an innovative approach for its extension that would be complimentary, yet modern. We designed the new extension to the façade to meet these needs enhancing the overall appearance of the Square and wider New Georgian Town conservation area by creating a charming entrance that will greet the theatre’s patrons. As with all recent Space Architect’s projects, Building Information Modelling (BIM) was critical to the coordination of this cherished Grade II listed theatre. Mike Varlow, Associate Director at Space Architects commented: "We are a company convinced of the benefits of technology as a way to innovate and to improve the accuracy and speed of design, and this translates into our approach toward restoration projects such as the New Hull Theatre. It’s our second Grade 11 listed theatre restoration, the previous one being the Darlington Civic Theatre. “For this project, we knew that a cloud survey of the existing building was a fundamental foundation for the design and coordination of the project, particularly regarding the accommodation and routeing of the extensive services and theatre technical equipment in the retained areas of the existing building. Only by utilising digital construction methods were we able to fully address the complicated needs for this theatre design and deliver a functioning, practical, yet beautiful and sophisticated building." The most modern of digital construction methods has seen the successful refurbishment of this precious historical building, setting the scene for preserving and enhancing this cultural asset and leaving a legacy for the vibrant city of Hull.